While in San Francisco's Japantown recently, my husband came across The Paper Tree, a shop that sells origami paper and art supplies. Knowing this find would be right up my alley, he snapped a picture of a beautiful origami kimono jacket that was on display in the store's window. Made by Linda Tomoko Mihara, it's constructed from just one sheet of folded paper! Linda is a member of the family that owns the store. 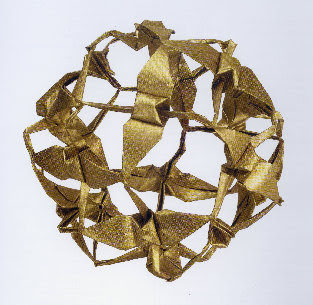 Her grandfather, Tokinobu Mihara, published two of the first English-language origami books in America in the 1950s. Linda has been practicing origami since age 5 and is known for dollar bill folds and a connected cranes technique. She designed this intricate Peace Sphere, a globe of eighteen cranes folded from a single sheet of paper. Linda's Sembazuru designs are also remarkable. 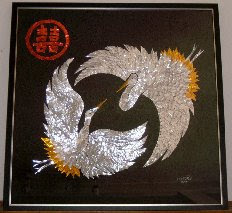 These are framed mosaics composed of 1,000 paper cranes arranged in a family crest or unique design. It's believed that if you have a special wish, folding one thousand cranes will grant the wish by the time the task is completed; cranes are symbols for luck and longevity. In ancient Japan, it was customary for a bride-to-be to make a thousand cranes to ensure a long and prosperous marriage. In the 1960s, Japanese-Americans in Hawaii began to create crane artwork for weddings, but 1,001 cranes were made because it's believed one additional crane brings extra luck. These framed pieces, composed of cranes made of gold foil, were displayed at a couple's wedding and then were hung in their home for good luck. The tradition continues today and has expanded to other ethnic backgrounds as well. 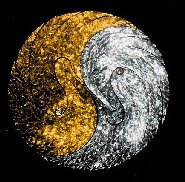 Another talented member of Linda's family is her sister, Vicky Mihara Avery. Vicky has written a book for children, Origami Fun for Kids! and also a DVD, Origami Fun for Kids, Too! She's an award-winning gift wrapping expert and has a DVD titled, The Japanese Art of Gift Wrapping.